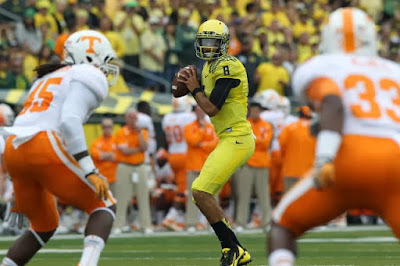 Sporadic Sentinel: Have We Just Seen The Best 10 Years In Oregon Duck Football History? Have We Just Seen The Best 10 Years In Oregon Duck Football History? Short answer: Yes. These have been, without question, the best ten years in Oregon Duck Football history. Actually, the stretch from 2005-2015 was actually the best 11 year stretch in Oregon football history. They went to 11 straight bowl games (12 counting the first-ever College Football Playoff title game) and won six of them. They went to six BCS/CFP games and won three of them- two Rose Bowls (the 2012 win being their first Rose Bowl victory in 95 years) and the Fiesta Bowl. They went to two Championship games and.... well, let's move on. They won at 10 games in a season at least 8 times and 7 years in a row (2008-2014). Chip Kelly was head coach four of those years and he finished 46-7, the best percentage in Oregon history by any measure and his worst season was his first year, 2009, when he went 10-3. Can you imagine in your worst season as a football coach you went 10-3? That's insane. From 1964-1988, Oregon didn't make a bowl game. That's 27 seasons, and I think that may be a record. I went to games in the early-to-mid-1980's when the Ducks were just about giving away tickets. 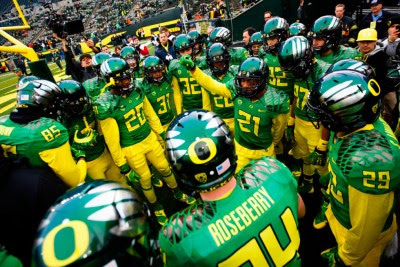 I've seen how bad Ducks football can be. In 2010 (the year after making the Rose Bowl for the first time since 1994) when Oregon went undefeated in the regular season for the first time since 1916 I tried to tell newcomers to Eugene how just insane it was that the football team was actually good and they wouldn't believe me. They thought this was normal. I showed these newbies tape of the 1983 Toilet Bowl, when the Ducks and Beavers played the last scoreless tie in college football history, and they looked at it like I look at footage of The Beatles in concert. Astonished and perplexed that such a thing could really have happened, that somehow it was all some sort of dream. That dream came crashing down the last two years. For being a quarterback whisperer, Mark Helfrich couldn't find a successor to Marcus Mariota even half as good as he was. Maybe Vernon Adams was half as good, but he couldn't stay healthy enough to prove it. That's because whoever was in charge of recruiting offensive linemen wasn't as good as whoever did it on Chip's staff. I'm inclined to believe that Chip was the offensive lineman recruiter, because the drop off seems to have happened after Chip left. It would make sense that the guy who invented the Blur Offense would be the best at talking linemen into it. The Oregon defense has also not been the easiest to recruit. It's a weird situation. The guys get to play a lot because the offense works so fast. But that means a lot more guys get to play a lot because the defense is on the field with much less of a break. And they'll never be the focus. It's a lose-lose-lose situation. And that's where Mark Helfrich found himself at the beginning of 2016. Another quarterback hole, and the defense was too bad to keep going the way it was, so he went with another transfer QB and tried Brady Hoke as a defensive coordinator. You know what happened there. 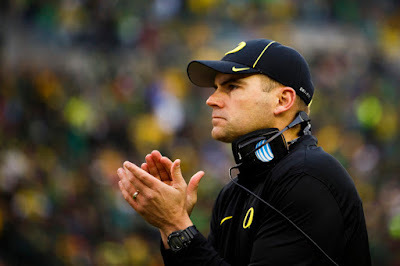 So it looks like Helfrich is all but done. On the outside given his total body of work it doesn't make sense, as he's 37-16 in his four years- yes, four years, the same length of time Chip was head coach- as Oregon's head man. But half those losses came this year. And 24 of the wins came in the first two years. He's 13-12 since Marcus Mariota left the Moshofsky Center for the last time. When a "prominent donor" (that founded a shoe company you may have heard of) has poured hundreds of millions of dollars into making Oregon Football a sensation off the field- the originators of the flashy uniforms, better training and recovery facilities than some NFL teams, and some of the cleverest social media campaigns around- and that team goes 4-8 and gets outmanned by an Oregon State team that barely seemed to know which way the goal line was at the beginning of the season- well, something's going to happen. Sliding back to a half-empty stadium would still be twice as many people as were there in the bottom-feeding days of the 1980's, when the Oregon athletic department honestly considered dropping out of the Pac-10 in football and joining up with Portland State in I-AA. Yes, I'm serious. The last ten years were not the norm in Oregon football history. They were the best ten years, and it's not even close. Even counting the 4-8 season this year, over the last ten years, from 2007-2016, Oregon has gone 101-30. Rich Brooks spent 18 years as head coach and went 91-109-4. Mike Bellotti spent 14 years as head coach and went 116-55. Yeah, it's been a good run. What's next? Who knows? Just know it won't ever be the same.